Extra Judicial Killing: 3 people were killed, Spot Sundarban, RAB - 8 involvement confirmed! 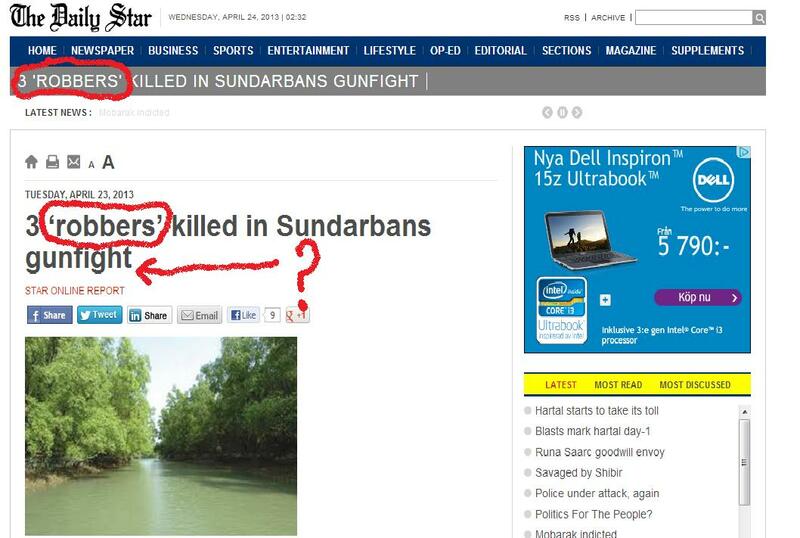 3 people were killed, Spot Sundarban, RAB - 8 involvement confirmed! The daily Stars reporting about Extra Judicial Killing in Bangladesh. By Bangladesh Media; Three men died in a so called "gun fight" in Sundarban forest, claimed by the Rapid Action Battalion (RAB). The daily Star reported that RAB 8 confirmed their involvement in the operation. The incident took place just after the Human Rights Report 2012 published by the US department of States. 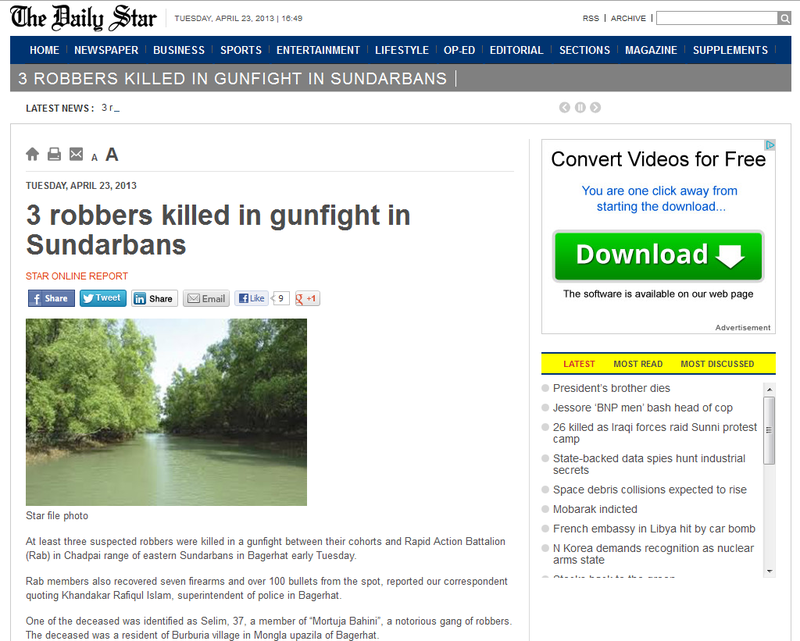 In a report with a caption 3 robbers killed in gunfight in Sundarbans the Daily Star wrote that "One of the deceased was identified as Selim, 37, a member of 'Mortuja Bahini', a notorious gang of robbers. The deceased was a resident of Burburia village in Mongla upazila of Bagerhat." Experts about extra judicial killings in Bangladesh questioned about language has been used for the news by the daily Star. "A news paper can not write they were robbers until proven by the court", says a prominent lawyer from Dhaka who wants to remain anonymous. He says -"RAB claimed they were robbers but the daily Star didn't verified anything. It has just reported the press release sent by the RAB. How could the daily Star write that there were a 'Gun fight'? May be they were simply killed!" The daily star wrote "acting on a tip-off, Rab raided a den of robbers’, 3-km inside Mregomari canal in the Sundarbans, around 4:00am, said Lt Col Faridul Alam of Rab-8, describing their drive. Sensing the presence of law enforcers, the robbers opened fire on them, compelling the elite force to retaliate with bullets, the Rab official said." The newspaper says "more than 300 rounds of bullets were exchanged during the 30-minute gunfight, added Lt Col Alam. At a stage of the gunfight, the robbers retreated. Later, Rab found the three bodies, seven firearms and more than one hundred bullets from the spot. The Rab personnel assisted by Mongla police were conducting a raid in Joymoni area, adjacent to the canal, to nab the rest of the gang members." It could be mentioned that just a couple of days ago the US Department of States has published its Human Rights Report for the year 2012 where the US Secretary of States expressed his concern about the enforced disappearances and the extra judicial killings in Bangladesh. The daily Star has changed its language in their on-line version. Instead of Robbers, now they have corrected the language (word) with a inverted comma. Now they have written 'Robbers'. But they haven't changed the word Gunfight. They could not verify if there were any Gunfight took place in Sundarbans or it was just the claim from the Rapid Action Battalione (RAB-8). May be these 3 men were taken there in Sundarbans and were killed by RAB 8. Later RAB claiming that the Gunfight took place and playing the drama that they have recovered fire arms and dead bodies. The daily Star has changed its language. Now it says 'robbers', not robbers any more. Please look! The daily Star, Please verify instead of narrating press releases or statement/claims from the RAB as news! We can buy bullets but can't buy lives. Instead of co-operating RAB please help us/support us to stop extra judicial killings. "Monirul Islam Hawlader, uncle of Selim, said he had been missing for two months. Mozaffar Hossain, deputy assistant commissioner of Rab-8, filed two cases with Mongla Police Station."